After a great comment thread on Facebook initiated by cellist Marie Sinco Warren, I realized I'm not the only one out there who feels a little baffled by teaching contracts. What should I put in there? How official does it need to be? Am I missing something? Marie suggested a post about it all, and I thought it would be fun to peek at a few other musicians' contracts. So, three very generous teaching artists below have volunteered to share their contracts and some info about their teaching contract experience. 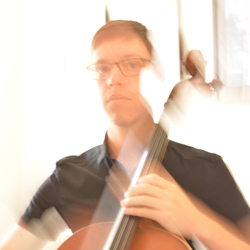 Justin Dougherty teaches cello and chamber music to private students in middle and high school, as well as at two universities on an adjunct basis. He's been teaching privately since 2008 (when he finished my undergraduate degree), and recently organized his studio into a full time job in 2012. "I've been using contracts for performances since 2010 to protect both the presenters' interests and my own. It makes it much easier to organize one's professional obligations when all things are written in concrete terms, with no ambiguity. My private studio contract isn't so much a contract as a set of clearly defined policies which seem strict on the surface, but really only lay out what happens in the worst case scenario." 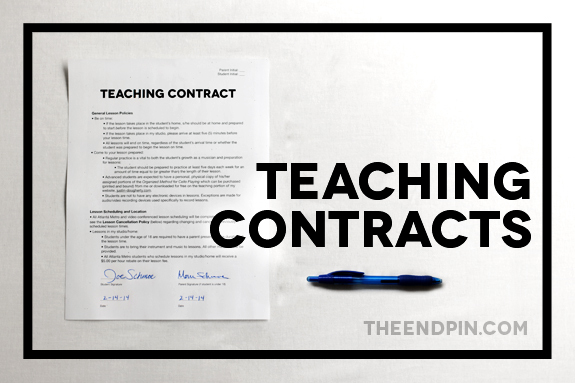 What's the most important part of your teaching contract? "The most important part of my contract deals with showing up. What I think many non-musicians don't think about is what they are paying for in a music lesson. It's not just the instruction (one's expertise), which is truly the largest factor, but also the time: a parent/student is paying me to reserve my time for them. In return for this reservation, I will show up and offer my expertise. My contract guarantees that the student will also show up during their reserved time, but if they don't, I am still compensated for it." What policy change has made the biggest impact on your studio? I recently changed my cancellation policy because my former policy had many loopholes and situational considerations. It was too case-by-case to be an effective policy. Now, I have a "no refunds or credits for cancellations of any kind" policy. In this policy, I've set aside eight hours each weekend for rescheduled lessons, and if a student must cancel their regularly scheduled lesson for any reason, they have 30 days to make up the cancelled lesson… If [parents] are unable to find a reschedule time over 30 days, they lose their tuition. So far, there have been no problems with this policy, and many parents find it freeing to have options and possibilities. Other contract thoughts or advice? If you think it (a situation) may eventually be a problem, add it to your contract. If you are fearful that a student may not bring their instrument to their lesson (gosh, why wouldn't they?! ), make sure you add it to your contract. If you think that a parent may try to pay you in Euros and you aren't so keen on that, make sure to define payment type. Update your contract regularly (yearly, at least) to either trim the fat from the contract or to add new policies to address ongoing issues that you've been having. Overall, remember: the contract protects both you AND your client/student/student's parent from abuse. 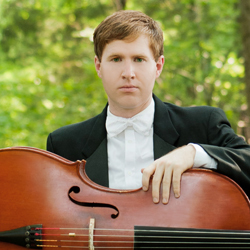 Eric Moore has been teaching cello privately since 2005, full-time since 2010. Currently he teaches weekly lessons out of his home studio but has also taught in other locations and through local music shops. "I started using a contract in 2008 when I started to have students who would cancel on the same day." "Clarity. Whether your teaching policies are flexible or rigid, being clear about your normal expectations and clear about foreseeable contingencies is important. Of my policies, the expectations about absence, extended absence and leaving the studio are the most important to my business. Since teaching accounts for most of my income, my students' payments are budgeted as though I were on a salary. I've started to think about this guaranteed income like rent - students use out my available time slots like they would rent an apartment. Leaving for a vacation doesn't get a person out of a weeks' worth of apartment rent. Similarly, two weeks' notice for me to fill the time slot is reasonable - that's income I expected to have and I need time to replace the tenant of that time slot." Has having a teaching contract helped you get out of tricky situations? Prevented them? "Over months or years with students (and parents) we get to know them personally and it can be tough when they email and ask for an exception to the policies. Rather than hem and haw because you feel guilty, having policies allows you to email back 'I'm sorry, I can't do that as per my policies but I hope they have a great time doing [whatever]! See you next week!'" "On a practical level, monthly tuition (rather than weekly) is awesome and I go so far as to keep it the same regardless of the number of weeks. Everyone knows they're going to get a lesson a week and that over a year my monthly rate is a tad cheaper than my "hourly" rate. I use Square Cash (no transaction fees and my students get points for using their debit cards) and the amount is the same every month. I used to have to calculate out how many weeks there were in the month and ask for that amount. This is much faster." 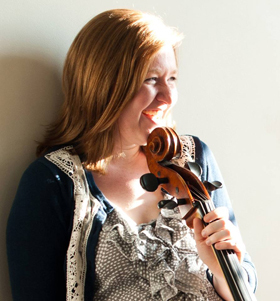 "As musicians, it is so easy to get into the mentality that we are somehow subservient to our students (or their parents) who are essentially patrons or donors. Not true. We are a providing a service to them and as such we need not feel shy or timid or awkward about being business people. That being said, my policies are very cut & dry and out of context could sound mean or heartless. I am, on the other hand, very much a goofball and I joke around constantly during lessons. The policies enable me to have that distinction and, ultimately, are just there as a worst-case-scenario for chronic problems." Ariana Warren teaches both at her home studio and at a private school. 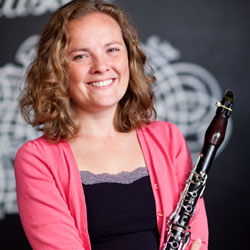 All of her teaching is through one on one lessons on clarinet, saxophone, and flute. "I started using a contract because it's really hard to get people to pay on time and cancel lessons in a timely manner. I ask that they pay up front for the month so that there is more incentive to give me notice when they will be away. If I have plenty of notice for an absence I don't have them pay for that week when paying the month's bill." "Not yet--parents are still bad about paying on time, particularly at the private school since I rarely see the parents. The kids stay after school and go to aftercare, so their parents aren't around to pester." Aren't these three the best? A HUGE thank you to Justin, Eric, and Ariana for sharing their experience. If you've had any helpful contract experiences, please please share them in the comments below! Disclaimer: This post is not a substitute for seeking legal advice from a licensed professional. To be sure your contract is legally sound and meets your business needs, please do hire a professional.